Dr. Gary Parsons graduated from the School of Optometry at the University of Waterloo in 1981 with his Doctor of Optometry (OD) degree. He spent one year working with local optometrists in the Waterloo area before returning to Toronto. 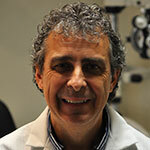 In 1982, Dr. Parsons returned to establish his own optometric practice in North Toronto. This practice is now part of the Drs. Parsons, Tong & Gupta optometric clinic that serves over 60,000 patients in North York. Dr. Parsons takes pride in providing his patients with quality vision care. Dr. Parsons has developed a very loyal patient base that has come to expect competent, friendly, personalized service. He especially takes satisfaction in serving the vision care needs of the many families that have been his patients for over 20 years. Away from the office, Dr. Parsons makes time for his many interests. In addition to family time, he enjoys participating in many recreational activities particularly golf. Dr. Parsons is licensed by the College of Optometrists of Ontario and a member of both the Ontario Association of Optometrists and the Canadian Association of Optometrists.